She received this recipe from a very nice lady in our church, who is an excellent baker, prepares her own rose-hip jelly, which makes her baked goods so decadent, and irreplacable. This torte requires some delicate handling of the baked cake layers, since each layer is baked separately, and somewhat challenging to remove from the cake pan, similar to the Irene’s Torte. Mix egg yolks and sugar together until light color. Add butter and vanilla, beat well. Add flour and mix until smooth and well blended. Place dough in a bowl, and refrigerate for a couple of hours, to set. Grease, and flour, 5 cake pans. Divide dough into 5 equal balls and fill pans. Bake at 325 for 15 min. Place in the freezer for 30 minutes, for easier removal. Invert each pan onto a cooling rack. Use a plastic knife to loosen up the sides of the cake from the pan. Firmly tap on the back of the pan to remove cake. Whip the cream to for a firm mixture. Spread the filling on the first cake layer. Repeat the above process with each layer. Frost the top and sides of the cake with the prepared frosting. Decorate with cake candy, or your favorite cake décor. Keep it cool in the fridge until ready to use. 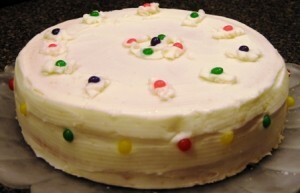 To store this torte in the freezer, keep in the the fridge for several hours, or overnight, so the frosting sets well. Wrap the whole cake in waxed paper, then in foil paper, to prevent it from frost bite. Place it in a plastic bag, and keep it in the freezer for up to 3 months. Unwrap fully before thawing. Thaw it overnight, in the refrigerator.